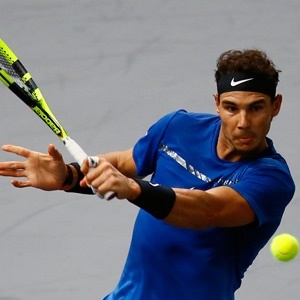 Paris - Rafael Nadal secured the year-end world number one ranking with a 7-5, 6-3 second-round victory over South Korean Hyeon Chung at the Paris Masters on Wednesday. Victory in Sunday's final in Paris would see Nadal move clear of Novak Djokovic with a record 31st Masters crown. But Frenchman Jo-Wilfried Tsonga failed in his efforts to reach the season-ending eight-man event with a surprise 2-6, 7-6 (7/4), 6-2 defeat by compatriot and world number 83 Julien Benneteau. Another home player, Lucas Pouille, kept his slim hopes of reaching London alive by seeing off Spaniard Feliciano Lopez 6-3, 6-4, but US Open runner-up Kevin Anderson's chances ended with a 5-7, 6-4, 7-5 loss to Fernando Verdasco.